Iyer, Vijay. ‘Imrpovisation, Action Understanding and Music Cognition with and without Bodies’. In The Oxford Handbook of Critical Improvisation Studies (2014): 73–90. Solis, Gabriel. ‘“A Unique Chunk of Jazz Reality”: Authorship, Musical Work Concepts, and Thelonious Monk’s Live Recordings from the Five Spot, 1958’. Ethnomusicology 48, no. 3 (2004): 315–47. Whyton, Tony. ‘Not a Wonderful World: Louis Armstrong Meets Kenny G’. In Jazz Icons: Heroes, Myths and the Jazz Tradition, Reprint edition., 57–81. Cambridge University Press, 2013. DeVeaux, Scott. 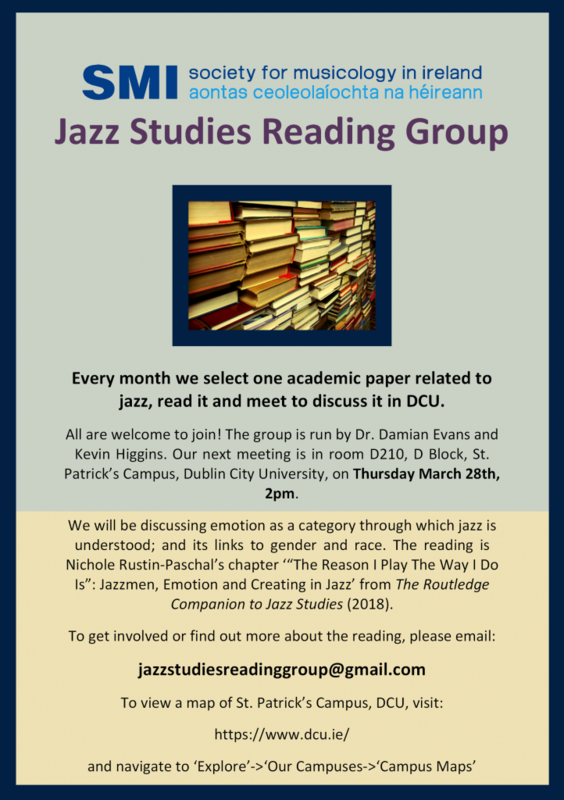 ‘Constructing the Jazz Tradition: Jazz Historiography’. Black American Literature Forum 25, no. 3 (1991): 525–560. Iyer, Vijay. ‘Improvisation, Action Understanding, and Music Cognition with and without Bodies’. In The Oxford Handbook of Critical Improvisation Studies, Volume 1, edited by George E. Lewis and Benjamin Piekut, Vol. 1., 74-90. Oxford University Press, 2014. https://doi.org/10.1093/oxfordhb/9780195370935.013.014. May 18, 2018: Jazz and gender. Tucker, Sherrie. ‘Big Ears: Listening for Gender in Jazz Studies’. Current Musicology, 71–73 (2002): 375-408. https://currentmusicology.columbia.edu/article/big-ears-listening-for-gender-in-jazz-studies?article=big-ears-listening-for-gender-in-jazz-studies&post_type=article&name=big-ears-listening-for-gender-in-jazz-studies. Monson, Ingrid. ‘Riffs, Repetition, and Theories of Globalization’. Ethnomusicology 43, no. 1 (1 January 1999): 31–65. https://doi.org/10.2307/852693. Stokes, Martin. ‘Music and the Global Order’. Annual Review of Anthropology 33, no. 1 (October 2004): 47–72. https://doi.org/10.1146/annurev.anthro.33.070203.143916. McKay, George. ‘Introduction’. In Circular Breathing: The Cultural Politics of Jazz in Britain, 1–32. Durham, NC: Duke University Press, 2005. http://www.loc.gov.libproxy.lib.unc.edu/catdir/toc/ ecip0512/2005012088.html. Whyton, Tony. ‘Europe and the New Jazz Studies’. In Eurojazzland: Jazz and European Sources, Dynamics, and Contexts, edited by Luca Cerchiari, Laurent Cugny, and Franz Kerschbaumer, 366–80. Boston, Mass: Northeastern University Press, 2012. Ronald M. Radano and Philip V. Bohlman, eds., ‘Introduction’, Music and the Racial Imagination (University of Chicago Press, 2000), 1-53. Stokes, Martin, ed. ‘Introduction’, Ethnicity, Identity and Music: The Musical Construction of Place. Berg Publishers, 1997, 1-27. DeVeaux, Scott. ‘Eckstine and Herman: A Contrast in Fortunes’. In Birth of Bebop: A Social and Musical History. Berkeley, CA: University of California Press, 1997. Solis, Gabriel. ‘Avant-Gardism, the “Long 1960s” and Jazz Historiography’. Journal of the Royal Musical Association 131, no. 2 (2 June 2006): 331–49. https://doi.org/10.1093/jrma/fkl016.